Many drivers do not realise it, but some styles of sunglasses are unsuitable for wear while behind the wheel of a vehicle. Some sunglasses may not allow enough light to enter the eyes, impairing visibility, while others may have a certain lens colour which negatively impacts the spectrum, and contrast, of colours distinguishable for a driver. This guide discusses these and all other factors involved in ensuring the driving sunglasses you choose will not increase your risk of causing a road accidents. It includes guidance on frame and lens styles, tint densities, coatings and safety markings. While oversized sunglasses with wide arms are currently in vogue thanks to celebrity fans like Victoria Beckham, Paris Hilton and Cheryl Cole, wearing them behind the wheel can be very dangerous. When choosing sunglasses for driving, it is incredibly important to ensure the selected frame does not compromise your peripheral vision. It can be easy to miss hazards that are not directly in view as a result of wearing oversized sunnies, significantly increasing the risk of accidents. While there are no official guidelines regarding the type of sunglasses which should be worn by drivers, you could find yourself penalised should you be involved in an accident and it be deemed your choice of sunglasses hindered you from preventing it. Aviators are a popular choice for drivers thanks to their flat profile and thin arms, but you may prefer a pair with lenses that wraparound the eye slightly, in order to prevent glare infiltrating from the sides. Lenses of different colours affect how much visible light is able to reach the eyes, how well a person can see certain colours, and the degree of visual contrast experienced as a result. As such, choosing the wrong coloured lenses can negatively impact how well a driver can see road signs and traffic lights, and spot potential hazards. Scientific research indicates pink, blue and green lenses should generally NOT be worn while driving as they can make red lights indistinguishable. Sunglasses in these hues labelled as safe for driving are the exception – the intensity of the featured lens colour can make a significant difference safety-wise. The best lenses for driving sunglasses are grey and brown because they are colour-neutral, meaning they do not alter how colours appear when worn. 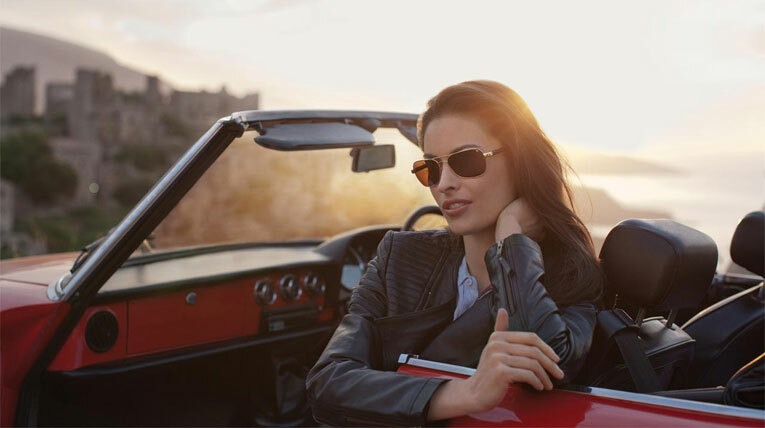 Many sunglasses specifically designed for drivers also feature yellow and amber-toned lenses, which can help to enhance contrast and definition. Whichever (safe!) colour lenses you opt for, tint density is another important consideration. Tint density is rated on a class scale of 0-4, and is the most important factor for determining how much light is able to reach the wearer’s eyes. Two similar pairs of sunglasses with grey lenses, for example, won’t block the same level of light should they have different density ratings. 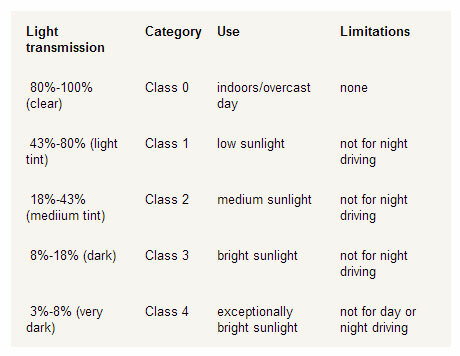 Here you can see that 3-8% light transmission sunglasses (class 4) should never be worn behind the wheel, while class 0 are only really useful when worn on overcast days, or for night driving. Driving while wearing sunglasses with an incorrect tint density can reduce concentration, or cause drowsiness, increasing the risk of road accidents. While many people like to wear sunglasses with variable – or 'photochromic' – lenses which see tint density change depending on the degree of UV light exposure, these are not suitable for in-car use. The presence of the windscreen can block up to 40% of UV light and delay the speed at which the lenses change colour, meaning drivers could end up driving with unsuitable shades on at any point (i.e. they could be too light or too dark). With photochromic lenses being unsafe for driving purposes, a fixed tint must be selected. Fixed tints stay the same colour regardless of the amount of light they are exposed to, and are available in standard, graduated and polarised lens styles. Graduated lenses – that are a road-safe colour and have a suitable tint density rating – can be safely worn behind the wheel of a vehicle. Some drivers prefer graduated lenses, for the bottom of such is a lighter colour, allowing the dashboard to be seen clearly, while the top, darker half works to ensure clarity of vision in bright conditions. Polarised sunglasses are a common choice for drivers because they dramatically reduce glare caused light reflecting off of wet surfaces. Glare can put incredible strain on the eyes and be very distracting. Many find polarised lenses are ideal for driving in hazy and foggy conditions too, because they enhance and sharpen details. Choosing sunglasses with specific lens coatings can help to ensure visual clarity while driving, as well as help to protect them from a certain degree of damage. Lenses are highly polished to ensure a smooth finish but this means they reflect around 10% of the light hitting them, if an anti-reflective coating is not present. This can be problematic since less light will be transmitted to the eyes, reducing visibility. Additionally, these reflections can be highly irritating – and therefore distracting – for drivers. Anti-reflective coatings offer another benefit too: they repel water and grease, meaning it is easier to keep lenses clean. Some eyewear manufacturers include their own patented anti-glare coatings for their driving sunglasses, polarised or otherwise. Anti-scratch lenses are also recommended – lines or dings on a lens can be more distracting then you might think! This is especially true considering that scratches can make glare problems worse. Click here to learn more about the lens coatings available from SelectSpecs. When you choose sunglasses for driving or otherwise, you should make sure they carry the 'CE' mark (this can usually be found printed on the inside of one arm). This mark indicates that the shades meet the European Standard BS EN 1836:2005, meaning they provide adequate protection from UV rays. All sunglasses stocked by SelectSpecs carry the CE mark. SelectSpecs stocks a wide range of budget and designer sunglasses suitable for drivers, including highly recommended brands Persol, Serengeti (championed by Formula One pilot, Alain Prost) and Maui Jim. The latter two labels are well known for their unique polarisation technologies. Love a different label? Browse SelectSpecs full range of designer sunglasses. The majority of frames available from us can be expertly transformed into prescription driving sunglasses, and many of the before-mentioned lens coatings are offered completely free of charge during the checkout.